Union members: Workers in a unionized employee group who choose to be members of and pay dues to the single union that represents their bargaining unit. Nonmembers: Workers in a unionized employee group who have opted out of membership in the single union that represents their bargaining unit and are representing themselves independently. Nonunion: Employees in a nonunionized employee group. Worker’s Choice will not affect two of these categories of employees: union members and nonunion employees. Union members would still work under exactly the same terms and conditions of the collective bargaining agreement negotiated for them by their union. All of the state laws that govern collective bargaining for these unions would remain the same. Likewise, nonunion public sector employees would still have all the protections of civil service status (to the extent allowed or mandated under state law), and their employers would maintain the ability to negotiate individually with them. Only nonmember employees would be affected by Worker’s Choice. While they may be part of an employee group that is unionized, nonmember employees would no longer be subject to the terms and conditions of the collective bargaining agreement negotiated for their employee group by a union. Instead, nonmember employees would be treated as independent workers, essentially the same as nonunion employees. Unions would no longer represent them in grievance or disciplinary hearings. These nonmember employees would have the same rights that nonunion employees currently have, such as those guaranteed by state civil service laws for public employees, occupational safety and health acts and the federal Civil Rights Act of 1964, among others. [*] Similarly, public sector employers would have only obligations to these nonmember employees as they do to nonunion employees. If employers are under no “duty to bargain” with nonunion employees, they would also not be required to negotiate new contracts with nonmember employees. Conceivably, employers could give nonmember employees a take-it-or-leave-it contract offer and refuse to negotiate any further, a routine practice for employers of nonunion employees. 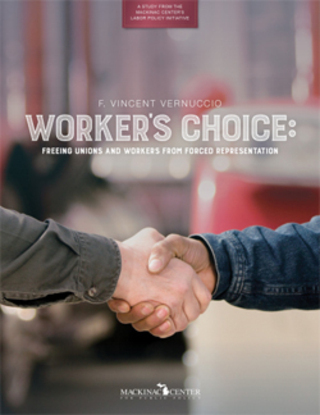 With Worker’s Choice, nonmember employees may likely receive similar terms and working conditions to the ones negotiated by the single union of their employee group. This would presumably make it simpler for public employers to manage two categories of workers. However, even in this case, the union would be under no obligation to negotiate for nonmember employees or represent them in grievance or disciplinary hearings. Further, as is common for the 93 percent of workers in the private sector and 61 percent of workers in the public sector who are not unionized, nonmember employees would likely be offered the benefits and working conditions that apply to all employees in a particular group, or even the entire workplace. None of this prevents these nonmember employees, however, from negotiating with their public employer for different and unique pay and working terms that best fit their individual needs. These could include flexible work schedules, merit-based pay or bonuses, remote work arrangements, special leave allowances and many others. Since some of these arrangements could potentially help public employers increase productivity and retain talented employees, it would be in their best interest to pursue these alternative working arrangements for these individual, nonmember employees. However, in some states, such as Michigan, public employers are prohibited from offering conditions of employment that would influence a worker’s decisions to join or not join a union. Under Worker’s Choice, therefore, public employers would need to be careful not to cross this line, especially because they could be offering different compensation and working arrangements to workers within the same employee group. States also are free to clarify nondiscrimination language in their current law to show that separate negotiations with nonmembers are not attempts to influence an employee’s decisions about union membership. It is hard to predict the exact impact that Worker’s Choice will have on public sector employment. Some nonmember employees who are apprehensive of negotiating for themselves may rejoin a union, for example. On the other hand, some union members, who would have otherwise maintained their membership, may be enticed to resign from the union by the opportunity to negotiate working conditions that are tailored to their individual needs. [*]In many states, working conditions for public employees are governed by other laws, such as teacher tenure acts and civil service laws. Therefore, nonmember employees may have other certain rights and privileges guaranteed by state law.